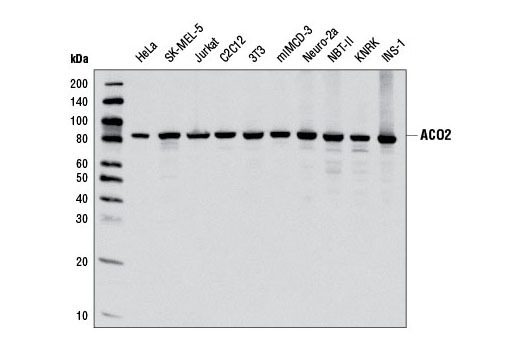 Western blot analysis of extracts from various cell lines using ACO2 Antibody. 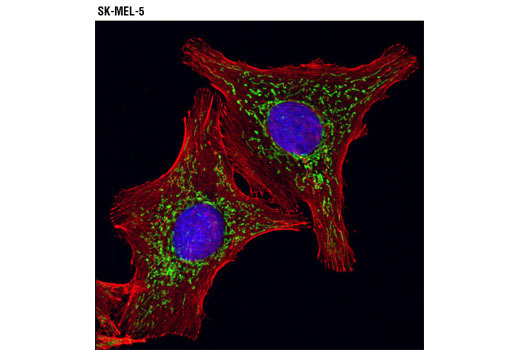 Confocal immunofluorescent analysis of SK-MEL-5 cells using ACO2 Antibody (green). Actin filaments were labeled using DY-554 Phalloidin (red). Blue pseudocolor = DRAQ5® #4084 (fluorescent DNA dye). ACO2 Antibody recognizes endogenous levels of total ACO2 protein. Polyclonal antibodies are produced by immunizing animals with a synthetic peptide corresponding to residues surrounding Gly540 of human ACO2 protein. Antibodies are purified by protein A and peptide affinity chromatography. Aconitase 2 (ACO2) catalyzes the conversion of citrate to isocitrate via cis-aconitate in the second step of the tricarboxylic acid (TCA) cycle (1,2). ACO2 is also an important regulator of iron homeostasis within cells (1-4). In addition, research studies have shown that this enzyme is deficient in the mitochondrial disease Friedreich's Ataxia (4,5). Gille, G. and Reichmann, H. (2011) J Neural Transm 118, 349-59. Mirel, D.B. et al. (1998) Gene 213, 205-18. Myers, C.R. et al. (2010) Free Radic Biol Med 49, 1903-15. Rötig, A. et al. (1997) Nat Genet 17, 215-7. Ye, H. and Rouault, T.A. (2010) Biochemistry 49, 4945-56.